Time to be creative! 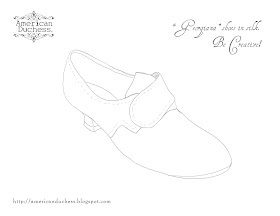 While we wait for updates to the new American Duchess 18th c. Shoes, I thought it'd be fun to draw up a little template that you guys can download and draw all over, to have some fun dreaming about colors, cockades, buckles, you name it. 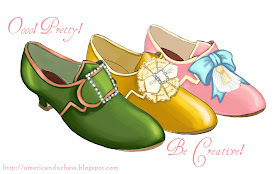 Get your design just right and ready to go for when your shoes arrive! Are these going to be covered in polyester or some other material? I've been looking at dyeing options and everything I'm reading about polyester is bad- doesn't take color well, not color-fast, only wearable once! Yikes! Any idea what the fabric is? WOO HOO! That is excellent!